We gave the tickets to the red-and-blue uniformed man at the turnstile next to the window. After the horizontal bars rotated, clicking twice, we found the concrete ramp that would take us up to the field and our seats. Amidst scores of people, moving slowly upward, this instant of time grew, in my mind, to momentous proportions. Finally, the crowd seemed to part like curtains at the unveiling of a statue, some going right and some left. I was hit with an intensity of color so strong that my other senses seemed to shut down. The mocha of the infield dirt in contrast to the chalky lines and bases, all surrounded by grass so green that only baseball fans have seen it before or since. It all seemed so close that you could touch it. Row after row of navy, wood-slat seats, many not yet filled, stretched a city block to the right and even further to the left. 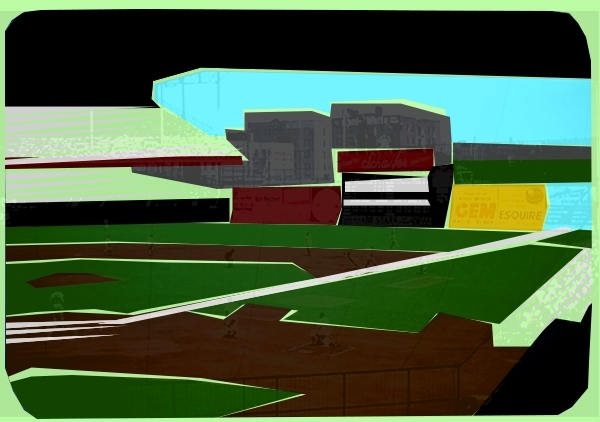 And on the distant walls a startling mix of color and words – the brightest of yellows, reds and blues mixed with the coal black scoreboard on the imposing concrete wall to the right, topped with a chain link fence, rising three stories above the field. Above it all, a second deck of seats, much like the first. Nothing had prepared me for this moment. Not the occasional game on the seven-inch televisions in our living room, the screen flickering in a wide range of grays; not the rare color photographs in the Sunday newspaper or magazine; not the artist renderings on my baseball cards, a little more than two inches on a side. I was in awe of the ballpark. As I adjusted to the visual sensory overload, my other senses came alive. The bouncy organ music seemingly coming from everywhere, the growing murmur of the crowd as the ballpark filled up, the shouts of vendors hawking hot dogs, beer and orange drinks; they came at me all at once. Competing with this profusion of complimentary sounds were the smells, more foul than fair, and not at all complimentary: cigar smoke, spilled beer, boiled hot dogs with just a hint of meaty aroma masked by spicy brown mustard and pickled sauerkraut. No faint-hearted odors survived here. My dad pulled me along, my eyes fixed on the field, as we followed the usher to our seats. The pitchers were warming up in front of us, the catchers with their backs almost to the screen. The hurler for St. Louis, to my left, did not fix my attention. To the right, however, in his ivory-colored jersey with the scripted Dodgers across the front stood the biggest man I had ever seen. I knew his stats by heart–he stood 6’4” and weighed 220 pounds—as I had started collecting baseball cards and had memorized the backs of all the Dodger cards. Standing atop a 15” mound, less than 100 feet away, Don Newcombe was an imposing figure. Zip, smack–the sound of a major league fastball hurtling through the air to hit the catcher’s mitt – is like a slap in the face; it gets your attention. And it implants itself in your brain, for sixty years, at least. “Big Newk,” he was called, a nickname that needs no explanation. The three umpires took their positions and the Dodgers ran onto the field as the organist played their theme song “Follow the Dodgers.” I have strong recollections of two other players – both left-handed hitting Cardinals. Their leadoff hitter was Harry “the Hat” Walker. He led the National league in hitting in 1947 but that didn’t impress a seven-year-old. The source of his nickname did. With my dad’s encouragement, I watched Harry closely as he readied for the first pitch. While most hitters swing their bat back and forth to set their timing in preparation for the pitch, Harry doffed his cap several times instead, eventually satisfying himself as to its placement, its beak shielding his sweaty brow. I was caught off guard when the Cardinal’s third batter came to the plate. Instead of the mild chorus of boos that had greeted the first two hitters, the crowd applauded warmly. I looked quizzically at my dad. “That’s Stan ‘The Man’ Musial. He’s a great player and such a good guy that Dodger fans cheer him even though he kills us.” His success in Brooklyn accounts for his nickname–a Dodger fan once yelled as Musial came to the plate after two big hits, “Oh, no, it’s that man again.” Stan’s preparation was unusual as well. He swung the bat back and forth like a pendulum. When he stopped, he twisted his body like a corkscrew, so much so that his number 6 faced the pitcher. The Dodgers went on to win 10-2. Five home runs were hit, I gained a pennant in Dodger blue and two new relationships: one with baseball that flourishes to this day, and one with my dad. Though just under six feet tall, my father, a sailor in World War II, had an intimidating presence with the shoulders of a football player in uniform and the forearms of Popeye. A man of great character and compassion and twelve-hour workdays, he was the classic strong, silent type. Starting on at glorious June day, baseball showed me a bridge across the silence between us–something for us to share at the ballpark and across the dinner table. Our relationship took on another dimension, one beyond the constant parental love and attention that had been present ever since he returned from the war in the Pacific. I fell asleep on my dad’s shoulder on the subway ride home, still clutching the pennant, a souvenir of the first best day of my life. N.B. The game in the story took place on June 17, 1950. Howard Wasserman was born a long time ago in Maimonides Hospital in Brooklyn. Until his parents dragged him to Far Rockaway, Queens, he lived in Bensonhurst during WWII with his mother and grandparents and Manhattan Beach (after his father returned from the Pacific) with his parents and brother. Howard graduated from Stuyvesant High School and CCNY, with a bachelor’s degree in electrical engineering. He left the city to pursue his career, stating “If the Dodgers hadn’t left, neither would have I.” With his nurse-wife, a graduate of the Jewish Hospital of Brooklyn School of Nursing, they settled in the Boston area and raised three children two of whom now reside in Metro NY. After a successful career in Electronics with the requisite MBA, Howard retired to Raleigh, NC with his second wife, to help her start a dog training business. Not one to be idle, Howard completed some coursework in creative writing at North Carolina State University and has embarked on his second career as a fledgling writer. His current project is a speculative-fiction novel about what actually happened in the Garden of Eden and the resultant consequences.